Mens wedding bands don’t have to be plain. Make a statement by adding diamonds or other gems to metals like stainless steel, platinum or different gold colors. We’ll help you and your groom pick one that’s both stylish and practical. Diamonds for mens wedding bands? 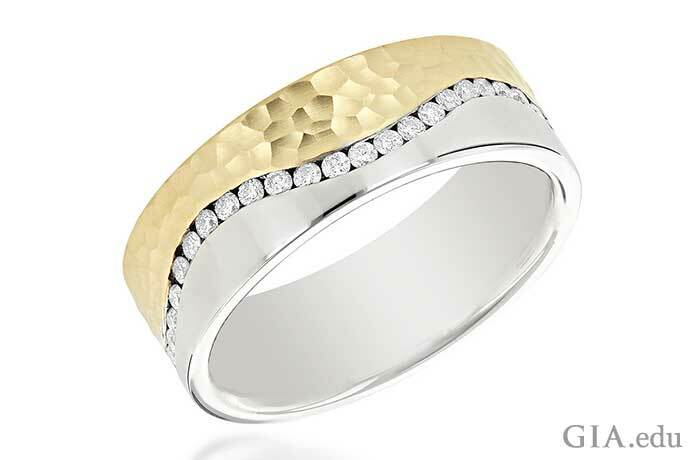 Mens wedding bands are a relatively new trend. Jewelers tried to popularize them in the 1920s, but they never caught on with grooms. They took on a life of their own during World War II, when men wore them to remember their sweethearts. Hollywood film star Humphrey Bogart’s decision to wear a wedding band following his 1945 marriage to actress Lauren Bacall likely sent a stamp of approval to his millions of fans. Fast-forward to the present and you’ll spot mens wedding bands on A-list celebrities, athletes and entertainers like Ryan Reynolds, David Beckham and Michael Bublé. When Prince Harry, now the Duke of Sussex, wed Meghan Markle, he chose to wear a platinum wedding band, a break in tradition from the Welsh gold typically used for British royal weddings. So, when it comes to tradition, who gets to select and pay for the groom’s wedding band? Fortunately, there’s no hard and fast rule when it comes to mens wedding bands. Often the decision is a joint one, with the bride paying for the band. Modern couples typically shop together: The bride weighs in on style and design, and the groom decides which wedding band is right for him. 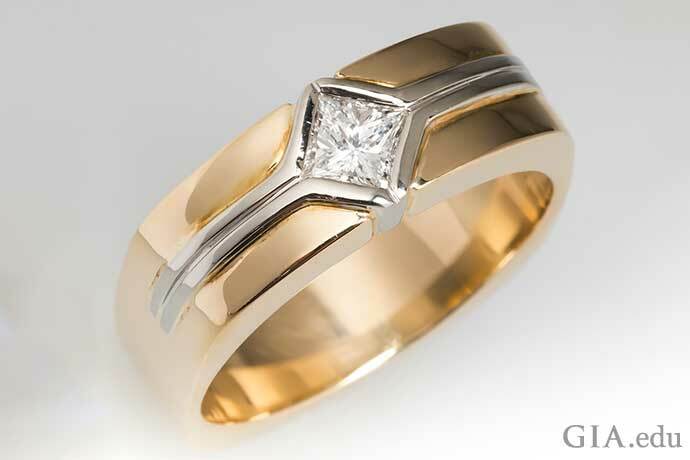 Yellow gold, white gold, rose gold and platinum are popular choices for mens wedding bands. But there are a host of other metals and materials that are also suitable. How do you choose? Again, it’s a combination of personal style, cost and a few other considerations. Yellow gold has been used in jewelry for more than 6,000 years. If your fiancé loves museums, historical novels/movies and classic cars, a yellow gold band might suit him well. Rose gold is a warmer option that is currently trending. Don’t discount it because it sounds feminine; darker shades can be quite striking. White metals like white gold and platinum have been in fashion for the past few decades. Go for one to get a cool, modern look. Mens wedding bands can also feature more than one metal. 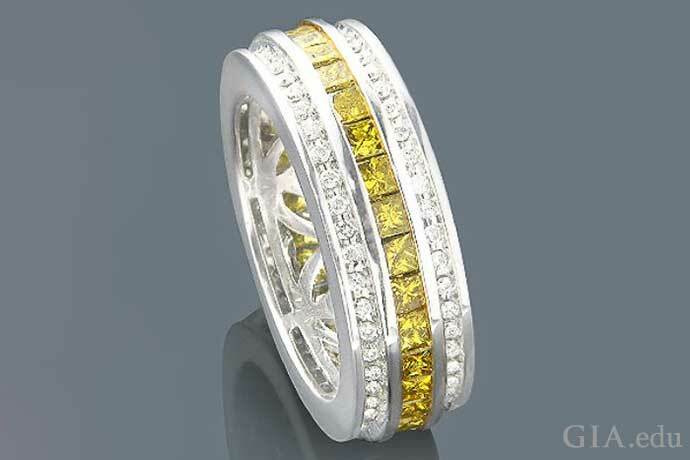 For example, combining yellow gold with white gold or platinum creates contrast and can make a strong statement. Allergies: Many people are sensitive to nickel or copper, which are metals commonly used in gold alloys. If he is allergic to these or other alloy metals, avoid yellow, white or rose gold. Platinum is hypoallergenic, so it is a safer choice if he has metal allergies. Tungsten carbide is scratch resistant and never needs polishing. Cobalt alloys are very hard and scratch resistant. Cobalt is also hypoallergenic. Stainless steel is scratch resistant, tarnish resistant and hard. It’s also affordable. Palladium has the same “white” look as platinum, is hypoallergenic and does not tarnish. It is also harder and more scratch resistant than platinum – and more affordable. Titanium is lightweight, scratch and corrosion resistant, hypoallergenic and extremely durable. It’s also affordable. Ceramic wedding rings are typically affordable and come in many colors. Ceramic is a tough and lightweight material, but – since it is not a metal – it can chip and break. If you opt for one of these alternatives to precious metals, be sure to consult your jeweler before deciding. Some materials are more difficult to resize than others. Some can’t be easily cut from the finger in an emergency. And some may not be suitable to your lifestyle. For example, tungsten conducts electricity, making is unsuitable for certain professions. 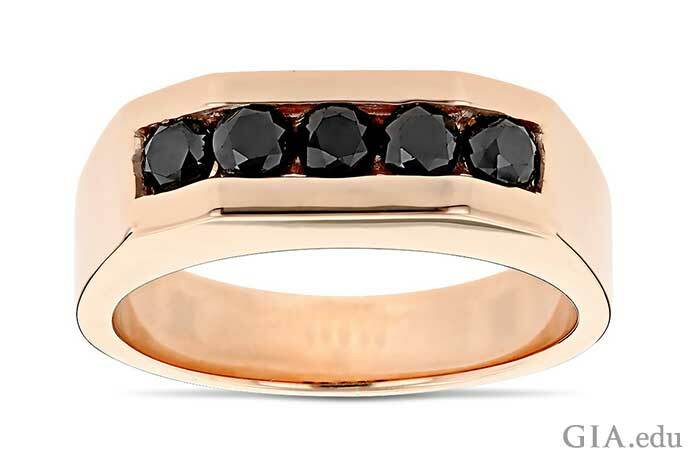 Learn more about these metal options by reading Men’s Jewelry: Alternative Jewelry Metals. The answer is a resounding, yes! 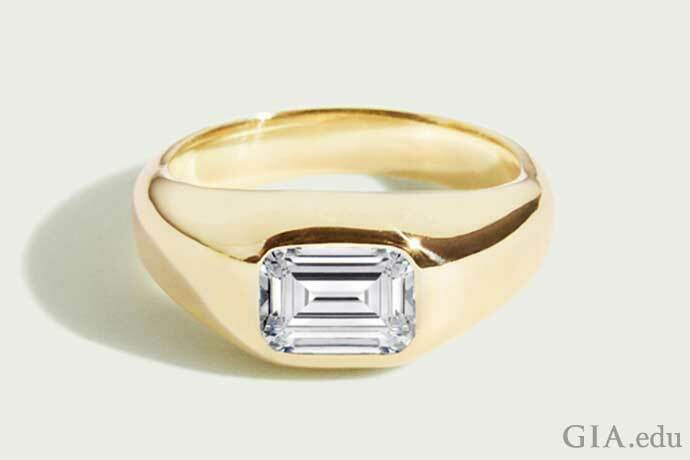 Diamond wedding bands for men are trending and for good reason. Ranking 10 on the Mohs scale of hardness, diamonds are renowned for their durability. They are also highly symbolic gems that add glamour and bling to an otherwise plain wedding ring. 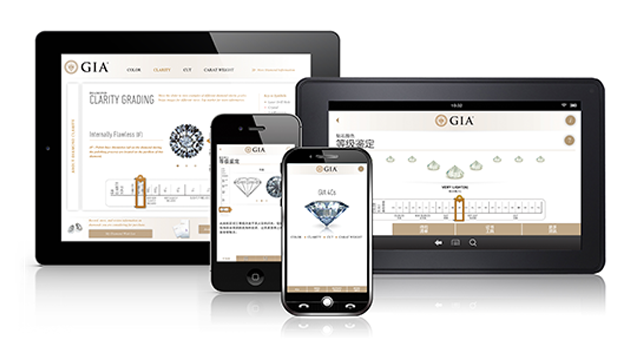 If your fiancé wants a diamond in his band, he may already be familiar with the famous GIA 4Cs of diamond quality from shopping for your engagement ring. So knowing about diamond color, cut, clarity and carat weight and how these influence value will help you both find the perfect ring in an ocean of diamond wedding bands. You can opt for a single, bezel set diamond for maximum durability. 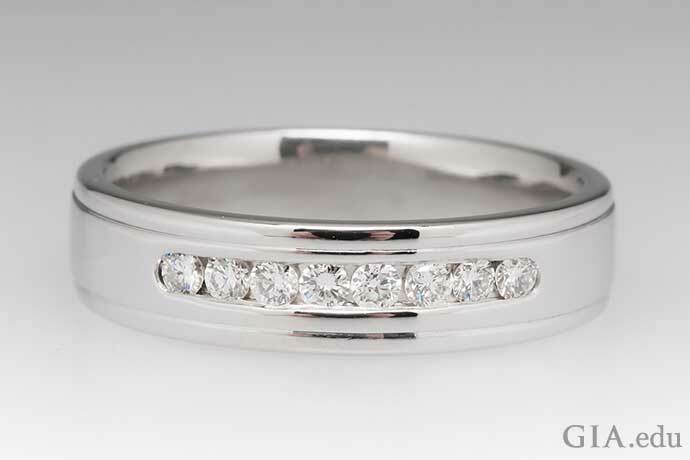 Or, if sparkle is the objective, consider adding diamond melee to the wedding band. Melee diamonds can be as small as 0.001 ct (1/1000 of a carat). These tiny diamonds are typically either single cut (round, with 17 or 18 facets) or full cut (round brilliant, with 57 or 58 facets). In mens wedding bands, they are often channel set or bead set into the band so they are flush with the surface of the metal. Here’s another reason to consider melee: Many tiny diamonds are usually more affordable than a single stone of the same weight. So, you can get a lot of sparkle for the money. If you’re considering a band with melee, you’ll definitely want to read Melee Diamonds: Tiny Diamonds, Big Impact. 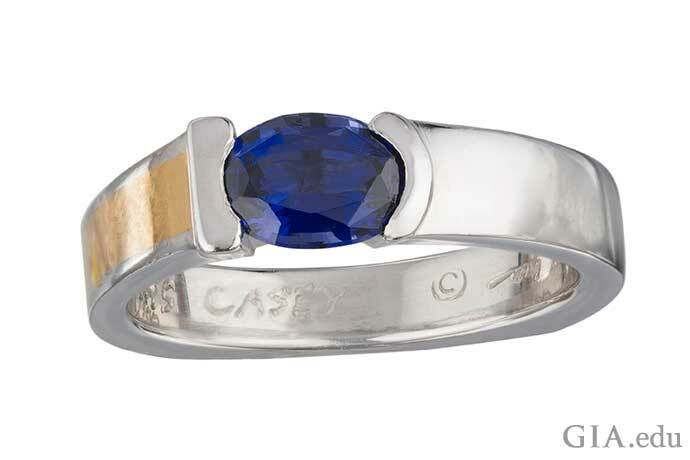 Adding gems like sapphire and ruby is a wonderful way to bring color to mens wedding bands. Both gemstones are beautiful and durable. They’re a 9 on the Mohs scale of hardness, making them suitable for everyday wear. If sapphire and ruby aren’t to his liking, he may want to consider his birthstone or another gem that is meaningful. Some gems, like emerald, aren’t recommended for wedding rings that will be worn every day because they can be damaged. Other gems – like garnet, spinel, aquamarine, jadeite and nephrite – can withstand daily wear and tear. If you go this route, it’s best to do a little research and talk with a trusted jeweler. 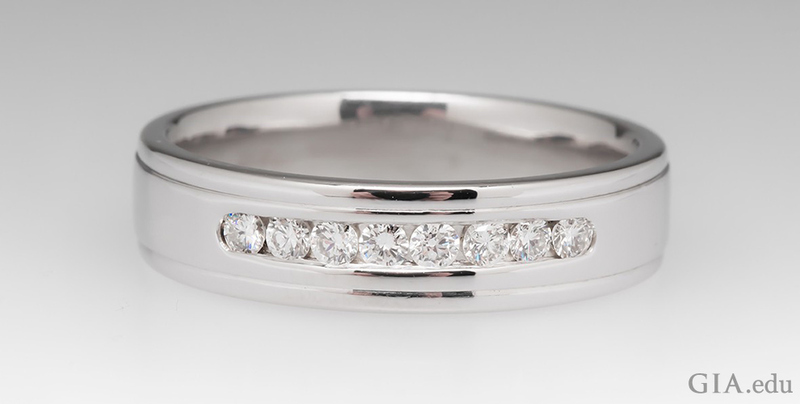 To protect gems in a wedding ring, consider a bezel or channel setting. A bezel is a jewelry setting style in which a thin metal strip is pushed or hammered around a gem to hold it in place. 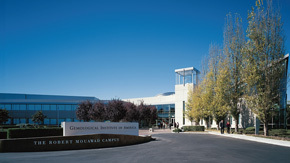 For a channel setting, gemstones of the same size are set edge-to-edge, with no metal between them, along two parallel metal walls. Once you’ve defined his wedding band style, chosen the metal and perhaps the gems, you’ll want to make sure the ring will fit. 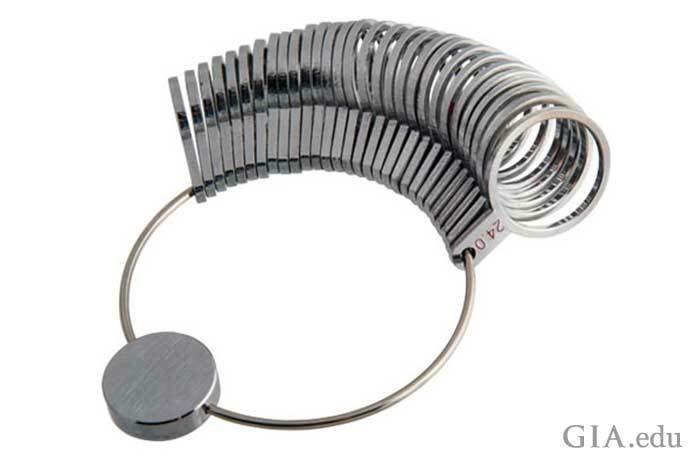 The best way to determine ring size is to have a jeweler use a finger gauge set (also called a ring sizer). It consists of a series of metal bands in ½ size increments that slide onto the finger to measure it for the most secure fit and best comfort. Your jeweler will know how to factor in temperature, humidity, altitude and even time of day, all of which can potentially affect finger size. Leaving it to a professional takes any uncertainty out of the process. Of course, wedding bands are not just for men – brides need them, too. Want to know about the trends and tips for pairing wedding bands with engagement rings? Our blog can give you the information you want.